Travis Wetzel Trio at Tri-PAC this Friday! If you’re looking to kick off your weekend with outstanding bluegrass, rock, gospel, country and jazz, look no further than the incomparable Travis Wetzel Trio this Friday, July 30th at the Tri-County Performing Arts Center on High Street in downtown Pottstown. These musicians are at the top of their game and they’ve played with the best in the business. Travis Wetzel is a dynamic musician, song writer, and vocalist. He’s been the lead fiddler/violinist on countless recording projects and has performed and recorded with the likes of Bill Monroe, Del McCoury, Mac Wiseman, David Frizzell and jazz legend Stephane Grappelli. Travis has worked for charitable organizations such as HALTER Therapeutic Riding Program with Wynonna Judd, The Parent Project with Charles Osgood of CBS’s Sunday Morning, and the VSA Arts of NJ. He can be seen and heard almost every week on the Grand Ole Opry with legendary instrumentalist and singer Jesse McReynolds. Bass player Ron Greenstein has toured Europe and the US with the Lewis Brothers and currently plays bass for folk icons Tom Paxton and The Chad Mitchell Trio. Acoustic guitarist Bob Harris has performed, produced and recorded nearly 1000 albums and sessions with some of the industry’s top acoustic and country musicians. A member of fiddle legend Vassar Clements’ band for 15 years, Bob was also the first place winner of Guitar Player International’s “Ultimate Guitar Competition” in 1992. So, order your tickets now and decide where you want to have dinner (check out the list of dining options at the Pottstown Arts & Cultural Alliance website!) Then get to Tri-PAC before the 8 pm start time. You won’t want to miss a minute! After a mad flurry of guesses among several fierce competitors, our winner is Debby Weber of Pottstown! She gets a 30-minute massage from High Street Yoga. Thanks to Barbara of High Street Yoga for the donation! 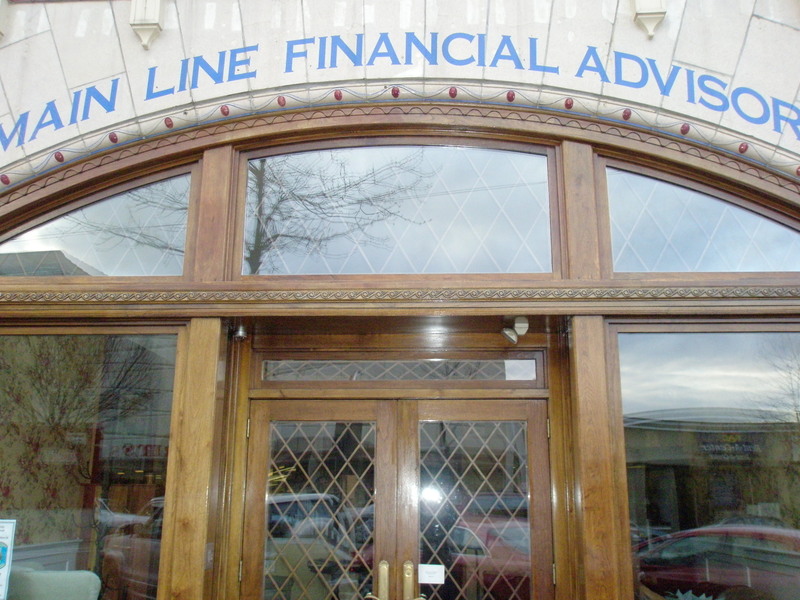 Main Line Financial Advisors occupy the former S. Miller & Son building at 211 East High Street. 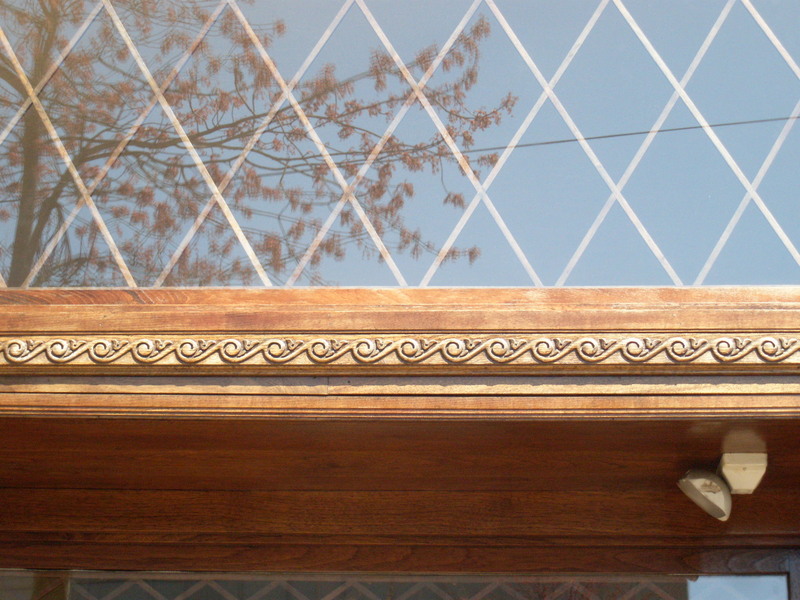 The image in the Positively!Pottstown header was taken from a photo of their front doorway. In addition to the intricate woodwork, I liked the blue of the letters and tried to mimic it in my header. Then I went for the Curlz MT font to mimic the woodwork. Totally amateur design sensibility! Main Line Financial Advisors does financial planning for individuals, families, businesses and institutions, along with integrated accounting and tax planning. The company was founded by Alfred “Fred” F. Matarazzo; his son Alfred “Al” F. Matarazzo, Jr. is the managing partner. 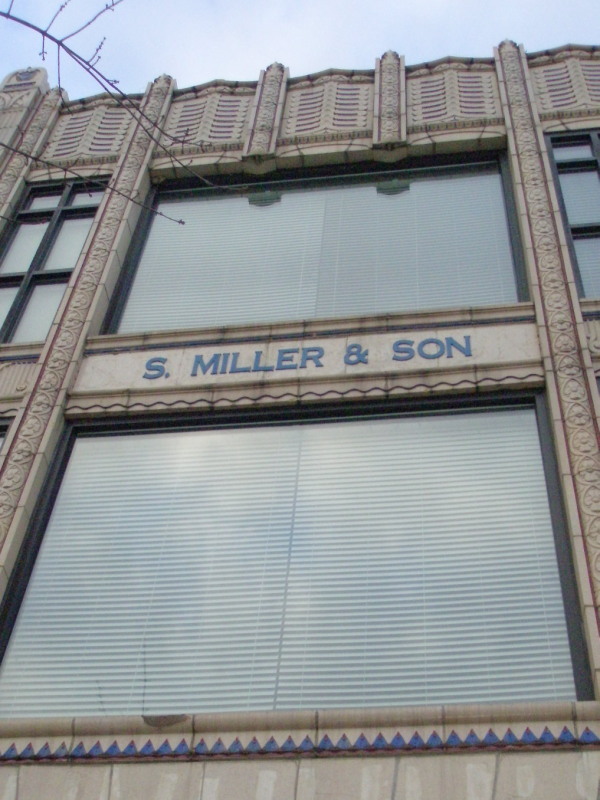 In 2005 they expanded and developed their Pottstown office. They also have offices in Narberth and Malvern. There were a few comments on the Positively!Pottstown facebook page. So far we’ve got Positively Pasta and the Elks Lodge as guesses — but no winners. Some great news: Barbara Kosiewicz of High Street Yoga has offered a 30-minute massage to the winner! Check out her blog here. Okay, here’s a hint to narrow it down, so everyone can go out to High Street after work and solve this mystery: The building is in the 200-400 blocks of High Street. SEE THE COMMENT BELOW FOR THE RUNNING LIST OF GUESSES! The view from Jason Bobst’s third floor office in Borough Hall provides a glimpse of the work he faces every day, managing what is essentially a small city that has a small-town feel. As Pottstown’s Borough Manager, Bobst oversees not only the typical activities of local government, but three other entities that are more often associated with cities and usually governed by separate entities. These are the Pottstown Area Rapid Transit system, the Pottstown Municipal Airport and the Borough Authority, which provides water and sewer to residents and businesses. That’s a lot of responsibility for any manager, but 28-year-old Bobst takes it all in stride and is already making his own mark on the position. “One of my biggest goals is to get citizens more active,” he said. And the key to that is communication. By using technology more effectively and holding face-to-face meetings in every ward, Bobst hopes people are encouraged to get involved. The Borough now sends out a newsletter three times per year, and there is a monthly show on PCTV about various aspects of local government. On the odd-numbered months, the program features Bobst and an elected Councilor. On the even-numbered months, a department head is featured, talking about what exactly their department does. Another use of technology is the implementation of the Swiftreach Network, or Swift911. Residents and businesses can sign up to receive calls in the event of an emergency or for getting important information. More about this service can be found on the Borough’s home page and, if you’re interested, you can then fill out this form. These communication efforts are coupled with the recently-instituted ward meetings, which take place in the neighborhoods and give residents a chance to get to know and directly address their elected officials, police, a public works representative and Bobst. 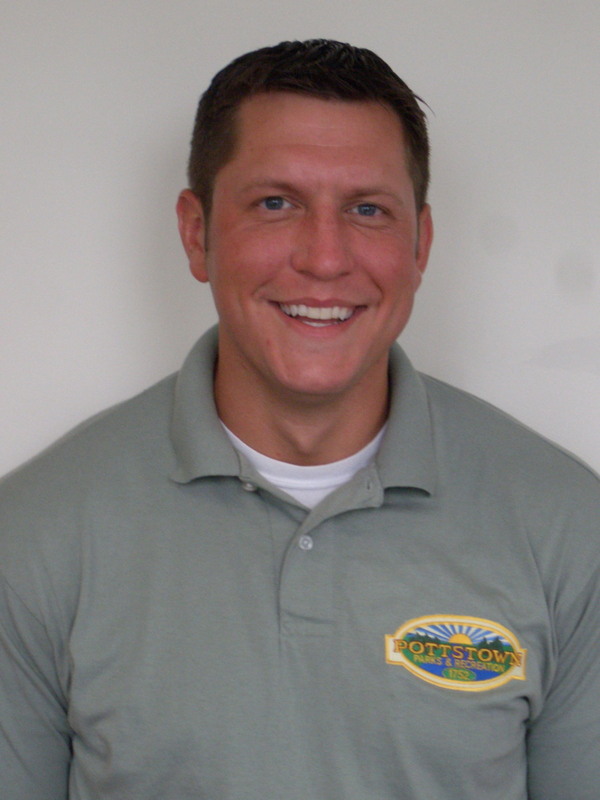 Jason is a 2004 graduate of St. Joseph’s University, where he majored in business administration and political science. He stepped up to Borough Manager a little over a year ago, after starting out as Assistant Borough Manager in September 2007 and serving as interim Codes Manager and interim Finance Director before taking the helm. Eventually, he’d like to get his master’s degree in public administration. “It’ll happen, but I’ve been kind of busy since starting this job,” he said with a smile. What does he listen to on his iPod to relax? That’s 98.1 FM, an oldies radio station that plays a lot of songs that some of us – ahem – listened to when they first came out in the 1960s, ’70s and ’80s. Exactly the kind of issue that would benefit from analysis and advocacy by the First Suburbs coalition is how PennDOT and the Delaware Valley Regional Planning Commission (DVRPC) set transportation funding priorities. They’re holding the Building One Pennsylvania Summit tomorrow, Friday, July 16, 2010, 10:00am – 4:00pm (doors open at 9:00) at Thaddeus Stevens College of Technology, 750 E. King Street, Lancaster, PA. I know a few Pottstown residents are going and I hope someone is going to officially represent the Borough. In a recent presentation to Pottstown Borough Council, a representative of the DVRPC described how the funding for the repair/replacement of the historic Keim Street Bridge wouldn’t be available for approximately 6-8 more years, or completed for at least 10 years. See The Mercury’s video here. The issue was also discussed by Jeff Leflar on the Code Blue blog. In the video, Council President Stephen Toroney notes that, ideally, the bridge would be re-aligned with Keim Street AND Keystone Boulevard would be extended to the Route 422 Stowe interchange, thus allowing Pottstown to be part of the 422 flow rather than cut off from it. Toroney rightly pointed out, “That’s the key to our Bethlehem Steel site. To get some businesses in there.” He asked about the possibility of fast-tracking and a public/private partnership to make those things happen. It wasn’t clear, due to the video editing, whether the DVRPC representative ever responded directly to those questions. I would not let this go. And I don’t mean that in a confrontational way. I mean that there is a strong regional planning case to be made for addressing this root-cause, which is directly connected to jobs and fiscal stability, through recurring dialogue and a working relationship with these agencies specifically around this issue. This problem is reminiscent of the ultimate effect on many of our nation’s cities of the Federal Highway Act of 1956, which funded the interstate highway system. Massive roadways and overpasses cut downtowns off from their rivers and diverted people, in their vehicles, away from city centers, opening up the countryside to housing and malls – what we now call “sprawl” – and leading to the disinvestment in urban cores. On a smaller scale, that is what the current PennDOT/DVRPC transportation funding schedule perpetuates – the continued re-routing of traffic (and consumer dollars) around a town center/small city. This funding schedule, even if unintended, is in effect their public policy. It is a policy that, due to inadequate access for the movement of raw materials and finished goods, actually also hinders private sector economic development dollars from flowing into Pottstown. For Pottstown’s former industrial sites ever to be re-used to their fullest, the newly formed Pottstown Partnership (which includes the County) will want to hit the ground running in talks with PennDOT and DVRPC to re-consider the current timeline on the Keim Street Bridge and to get the Keystone Boulevard extension on the table. The Partnership will also need to actively engage property owners, determining any clean-up and marketing strategies that will put these sites back in use. They are absolutely essential to Pottstown’s revitalization. None of these efforts toward the Pottstown Industrial Complex should be news. They are part of Goal #1 in the Action Plan of the Pottstown Economic Development Strategic Plan (March 2008). There may be a history here (of inaction) such that funding agencies might be leery of directing resources where they’re skeptical about their ultimate benefit. Fair enough. 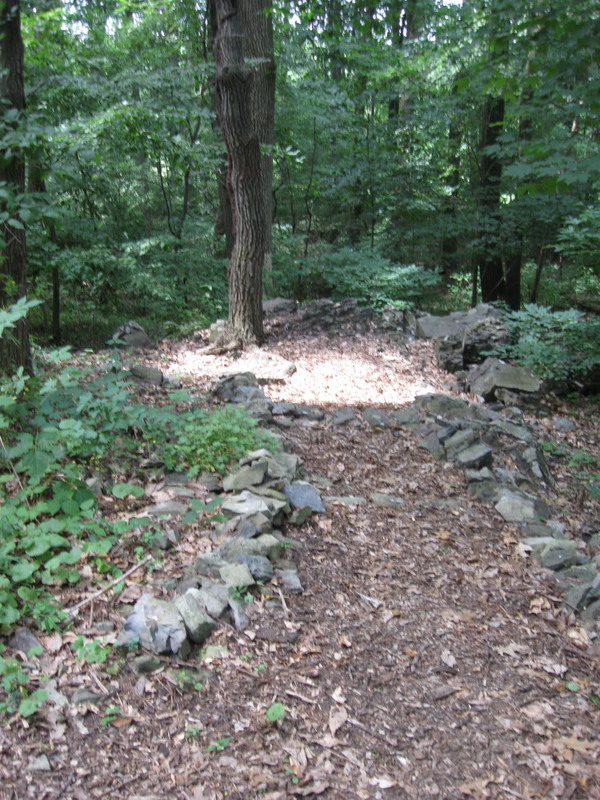 That’s where the Borough – on its own and in the context of the Partnership – needs to step up and be pro-active with property owners, pro-active in seeking grants for brownfields redevelopment and putting together a package of other financing incentives, and leading the way in this kind of First Suburbs conversation. I was in downtown Pottstown last week (interviewing your hard-working Borough Manager, Jason Bobst; look for that post in a couple days! 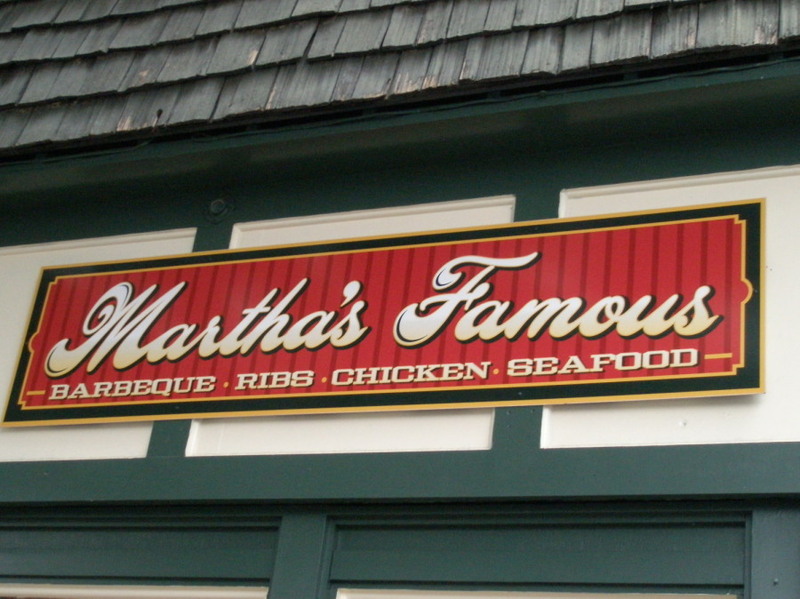 ), and I dropped in at Martha’s Famous on High Street in search of some cornbread. 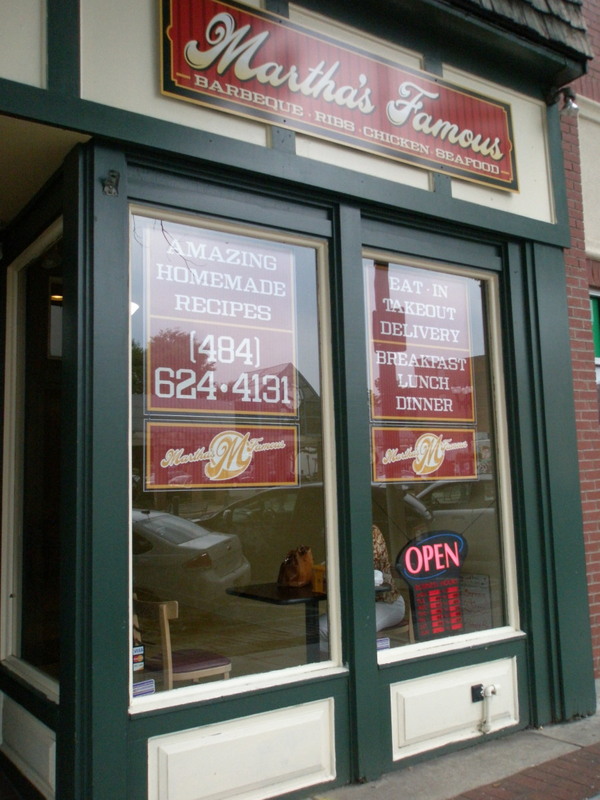 I’d been there months ago, when they first opened, but it was at night, and they’d actually run out of cornbread by then. Yes, I can vouch for the BBQ chicken and the candied yams – authentic, tasty and filling. But I’d been thinking about the cornbread ever since. Check them out online and use this coupon to get $3 off any order of $20 or more. Positively!Pottstown is proud to publish our first guest post and photos by Pottstown resident and freelance writer Rosemary Keane. Welcome, Rosemary! On a recent weekend in June, a good friend and I left husbands and kids at home to go on the Pottstown Area Garden Club’s annual garden tour. We were both looking for some inspiration for our own home gardens and we found plenty. All of the homes on the tour offered picturesque gardens, each with their own individual style and aesthetic. From the beautifully landscaped pool at the first home, to the Zen Japanese garden tucked away at a home in Trappe, we were amazed at the creativity and hard work that had gone into each one. 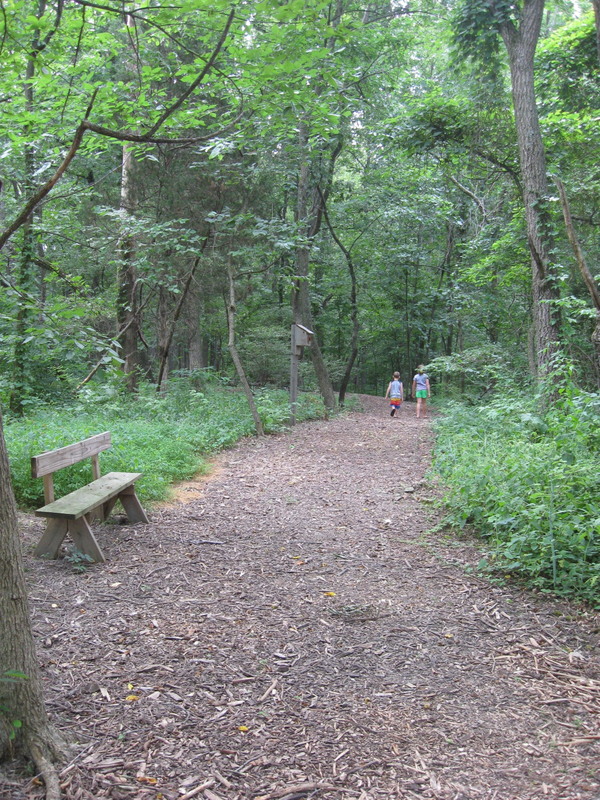 What we hadn’t expected to find was a 10-acre nature preserve – Beaufort’s Run – in Upper Pottsgrove Township. Tucked away on Detweiler Road, Beaufort’s Run is a privately-owned sanctuary that is open to the public and has been named a Certified Wildlife Habitat by the National Wildlife Federation. It was a hot and sticky Saturday morning, but as we made our way onto the wood chip path, we felt the temperature drop significantly under the shade of the trees. We followed the path all the way through the garden, which is dotted with little statues and signs and has several benches if you want to sit and just enjoy the beauty of the woods. Before we even finished walking the trail, we were talking about returning to Beaufort’s Run, but next time, we decided, we would bring our kids. There is also a geocache stashed away in the preserve, for which you will need your handheld GPS and the secret location to find it. If you’ve never heard of geocaching, it’s basically a 21st century, high-tech scavenger hunt which begins at www.geocaching.com and sends you on the hunt for hidden treasures. You can find more information about Beaufort’s Run and their mission to create a public resource with healing gardens, memorial gardens and a place for everyone to enjoy nature at their website: http://www.beaufortsrun.com. The Pottstown Garden Club, which consists of about 70 gardening enthusiasts, sponsors the annual garden tour. They meet the second Friday of each month at Emmanuel Lutheran Church on Hanover Street in Pottstown. During the summer months, they meet at members’ homes. For more information, you can contact club president, Jo Ann Waddell at 610-948-6415.